Details of Northern Ireland's victims' commissioners have been announced. Deputy First Minister Martin McGuinness told the assembly that all four posts were full-time and would receive the full advertised salary of £65,000. Mr McGuinness said he and First Minister Ian Paisley had taken legal advice before deciding to appoint four commissioners rather than one. He also said reports that the pair could not agree on one candidate "could not be further from the truth". 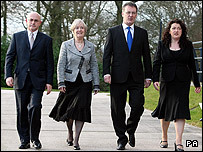 The four commissioners include broadcaster Mike Nesbitt and ex-interim victims' commissioner Bertha McDougall. The others are Patricia MacBride, whose brother was killed by the SAS and whose father died 17 months after being shot by loyalists, and Brendan McAllister of Mediation NI. In a statement on Monday, the commissioners thanked Mr Paisley and Mr McGuinness "for the assurances they have given us that they will make available all the resources and support they can. "We further welcome the £33m of funding announced today. "For our part, we acknowledge each other's commitment to victims and survivors and after our initial meeting, we emphasise none of us intends to limit our involvement to any group or sector or geographical area." Mr McGuinness said at no stage during discussions about the issue with Mr Paisley was there "a situation where the first minister proposed someone and I proposed someone as an alternative. "We were never in a position of disagreement as to how to bring this matter forward." Mr Paisley said having four commissioners was the best way forward. "Given the significant backlog of urgent work and the range of difficult challenges that face us in this area, these four people will have much more capacity to engage with victims and survivors than a single commissioner," he said. 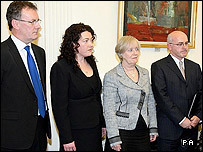 However, Alliance assembly member Naomi Long criticised the decision to make four appointments. "It is rather inconsistent for the administration, which has been sabre-rattling among the public services about overstaffing, to appoint four people to do a job which as recently as October both (Mr McGuinness) and the first minister agreed was a job for one individual," she said. On Sunday, Northern Ireland's first victims' commissioner said he believed a lack of trust within the community prevented just one person being chosen for the job. Sir Kenneth Bloomfield said he was pleased that appointments were being made, but that four "does seem rather a large number". Monday's official announcement follows a lengthy process, including a job readvertisement last autumn. The post is intended to promote the interests of victims of the Troubles. What defines a victim in NI?